With the competition for attention online at an all-time high, the struggle to keep followers engaged with your company’s social channels is real, and ongoing. In addition to the smart use of visuals, businesses often turn to social media contests and promotions to stir excitement and drive activity from their audience. It’s not as easy as tweeting “Who wants to win an iPad! ?”, even though we’ve all clicked on that at one time or another. Excellent social media contests require substantial planning and nimble execution. They have many moving parts and potential points of failure. Where will this contest take place? Facebook? Instagram? Twitter? Or will it be present in multiple venues, like a photo contest where participants can enter on Facebook or Instagram? Remember that each time you add a venue for participation, your oversight responsibilities grow geometrically. How do people qualify to enter your social media contest? There are hundreds of variations, but there are six main categories of participation mechanism. They are: Sweepstakes (nothing required—most common on Twitter); Connect (like/follow the company’s social account to enter); Like (like a particular piece of content to enter); Share (share a piece of content to enter); Vote (state preference from among multiple pieces of content to enter); Create (develop user-generated content and upload to enter). Remember: The more you ask your audience to do, the fewer will do it. Remember too that the younger your audience, the more comfortable they will be creating content for your contest. Is this contest seasonal? Does it tie into a particular product or service? Remember, the theme/name will guide the rest of the creative. Take some time to come up with something that resonates. Try to keep your contest name short, as long names eat up valuable characters in tweets and ad headlines. This is where you coordinate the major elements of the social media contest. The best approach here is to work backward from the date that you want to announce winners. From there, figure out when judging starts/ends (if applicable), when entries close, when entries open, when promotion starts, and other key milestones. Be sure to account for time to develop the creative, get approval for the contest rules, and any other internal hurdles that you need to cover before launch. In today’s social media landscape of visual billboards, you’ll need strong graphics and video to support your contest. Graphic needs may include cover and profile images, logos, headers, landing pages, emails, promoted posts, carousel images, or ad images (to name a few). 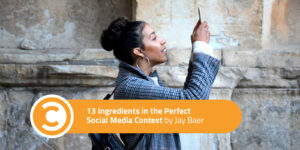 Videos explaining and promoting the contest should be in both vertical (Snapchat, Instagram) and horizontal (YouTube, Facebook) formats, and likely various other lengths to maximize impact across different social channels. To make sure your design team doesn’t mutiny, use your timeline from step four and give them a single list of everything you need, including specific pixel dimensions and required language or copy. For Facebook, remember the 20 percent rule when creating graphics for promoted posts and ad images. Remember, the prize itself can be the theme for the contest, as with the legendary “best job in the world” campaign from Tourism Queensland. The best contests have prizes that tie directly back to the company itself. This becomes particularly important when you consider the downstream results of this effort. You want to activate and attract people who are genuinely interested in your business, not just “contest hunters” who enter everything they can find. If you sell fishing gear, give away fishing gear as a prize, not an iPad. Here’s where you map out (via Excel, a custom Google calendar, and/or your social media management software) all the social media posts, email messages, advertising support, and other communications about your promotion. You don’t necessarily have to write all of the messages in advance—although it’s not a bad idea, and your legal team may require it. Remember that your social media contest (and corresponding communications) has five phases: pre-launch, launch, last chance, completion, and winners. You need to plan multiple messages across multiple platforms for each phase. This applies to the pre-launch and launch phases of your social media contest. This is where you figure out how to give your promotion the best chance of lift-off in the critical early days of the promotion. What you’re trying to do here is make sure that the people who already love you, and the people who have a disproportionate number of social connections, are fully aware of the contest and are ready to participate and spread the word the minute the promotion begins. This could include special “Shh, Coming Soon” emails to key customers and social influencers, making sure all employees are aware of the event and other opportunities. Remember: You do not want to “soft launch” a contest. This is especially true on Facebook, where the algorithm dictates that slow starters get buried. With the exception of simple Twitter contests and basic Facebook contests that are managed within your timeline, you will probably need some sort of amplification to ensure that your contest has the reach (and garners the attention) you desire. This may include Facebook and Instagram ads (think about custom audiences ads shown only to your email subscribers), Facebook promoted posts, Twitter promoted tweets, ad opportunities on Pinterest, amplification networks like Outbrain, Taboola, and Stumble, and other options. Remember that even if your contest takes place on one platform, you can use multiple platforms to amplify it. I purposefully put rules and legal advice tenth on this list because I have found it is much easier to have legal weigh in on the entirety of the program (including seeding, editorial, amplification) all at once, instead of having them look at the mechanism and prizes first, and then going back to them later with a second round of inquiries about the other elements. As with the design team, make legal’s job easier by giving them the total picture up-front. Be proactive by doing your research first on what each venue allows for contests, and have the links ready to share with legal. (Here’s Facebook’s Pages Terms.) It’ll make them happy, and you absolutely want to keep them on your side. Participants and prospective entrants will have questions and comments about your contest. Some will be easy to address. Others may not be so simple. It is absolutely critical (even for simple contests) that you have a defined plan for who is moderating and overseeing your social outposts. This doesn’t just mean the channels where the contest is located and normal business hours. What is your plan for coverage on nights and weekends? Your day-to-day community management realities will likely be modest compared to what you need to accomplish during a contest. Plan for this. As with amplification, you may not need software if your social media contest is very straightforward. But for any sort of contest that requires data collection as part of the entry mechanism, you’ll need software to help build and manage the affair. There are literally dozens of software packages that help you do this, either as their sole function or as part of a larger suite of social media management capabilities. Here at Convince & Convert, we’re familiar with most of them but haven’t used them all first-hand. Wyng: For mid-sized companies on Facebook and beyond, this software packs tons of campaign and content templates and ideas. Shortstack: For small businesses up to large agencies, this is one of the legacy providers for contests on Instagram, Facebook, Twitter, and YouTube. Strutta: For medium/large companies hosting contests on Facebook, Instagram, or their own microsite, their DIY and custom packages make this software accessible for most. Woobox: This software is designed for mid-sized companies and large brands that make Facebook a top priority. Wishpond: This tool works best for medium/large companies connecting contests to lead generation. Rafflecopter: This is one of the best options for bloggers and solopreneurs looking to run a simple giveaway with multiple entry points. 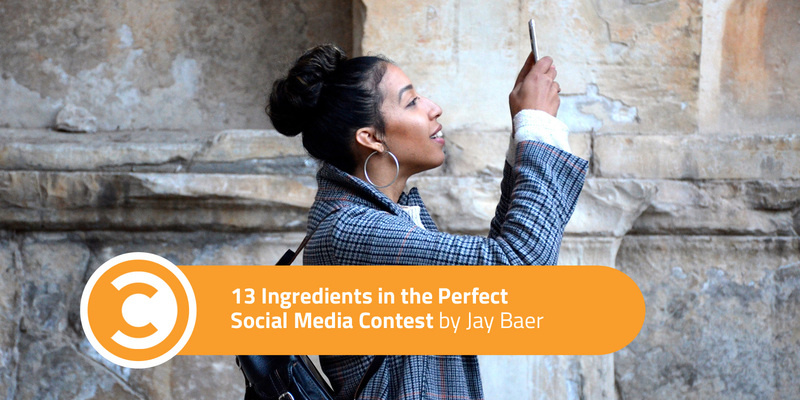 Those are the 13 ingredients of the perfect social media contest. What did I miss?